If you’re sick of having bland lighting in your room and need a new way to incorporate lighting, try these two different doily lamps. One goes directly over the light bulb. 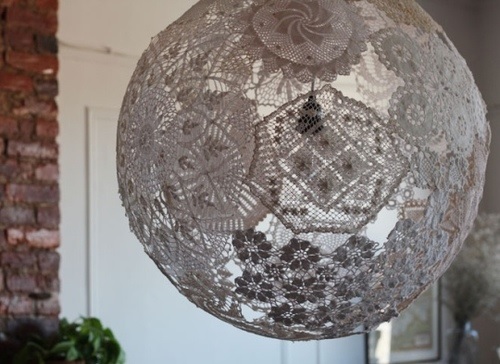 If you cannot cover your light bulbs, then try the doily lamp that you can put a candle inside of. Blow the balloon up to make it as large as you want your frame. Take the string and tie it around the tie of the balloon. Then, tie the other end to something so that you can let the balloon dry once you have glued the doilies. Take the doilies you have collected and paint them with your form of glue: wall paper glue or mod podge. 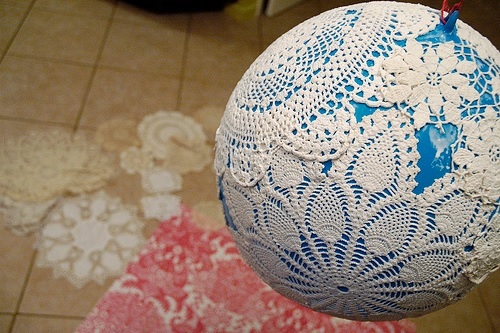 Attach the glue-soaked doilies to the balloon, overlapping the doilies when you attach a new one. Once all doilies are on the balloon, paint an additional layer of glue on the doilies and balloons. Let the doilies dry on the balloon for a whole night. After about 24 hours, pop the balloon. You will need to cut open the top of the framework in order to get the bulb inside of the frame. But, cut it smoothly, because to make the shade look more finished, you will want to sew it back on. If you cannot do the light bulb version, try the candle version of the doily lamp. Follow the same steps except when putting the doilies on the balloon; only put doilies on half it. This way, after it dries, you can pop the balloon and set the candle directly inside! Your dorm or apartment complex may have restrictions, but try either DIY version and voila! You have new, decorative lighting! Disclaimer: College Gloss writers find DIY projects on Pinterest and the web to share with our readers. We do not claim to be experts, and College Gloss, its owners, writers, editors, or agents do not assume any liability for results of projects posted.